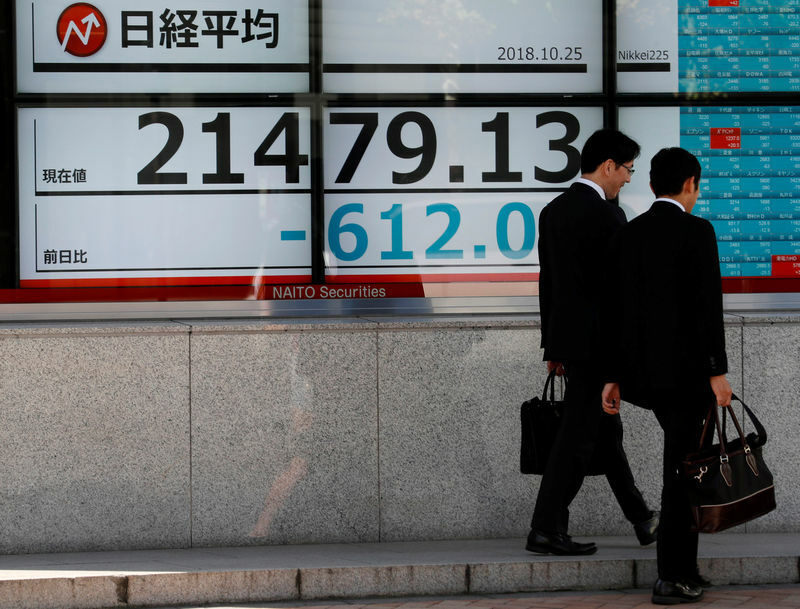 SYDNEY (Reuters) – Asian shares plunged on Thursday as hundreds of billions of dollars hemorrhaged from global markets after a rout in tech stocks inflicted the largest daily decline on Wall Street since 2011, wiping out all its gains for the year. Spreadbetters pointed to a subdued start for European markets with London’s FTSE index (), Germany’s DAX () () and France’s CAC 40 () all set to open in the red. FTSE futures () were last down 0.9 percent. E-Minis for the S&P500 () were flat after being up as much as 0.4 percent earlier in the day. MSCI’s broadest index of Asia-Pacific shares outside Japan () skidded more than 2 percent and has now lost more than 18.5 percent of its value so far this year. Japan’s Nikkei () tumbled as much as 4 percent to a six-month trough while the Topix index () plunged 3 percent, evaporating more than $155 billion in market value. Chinese shares too were in the red with the blue-chip index () plummeting as much as 2.5 percent as fresh market-support measures by the Chinese government failed to ease worries about high leverage and the tariff war with the United States. The index did pare some of its losses and was last down 1.2 percent. “If you’re a company and you’re in charge of a capex budget there is so much uncertainty about the next few years in terms of a trade war, in terms of Brexit,” said Jim McCafferty, head of Equity Research, Asia ex-Japan at Nomura. Some companies, including industrial bellwether Caterpillar (N:), have already warned about the impact on business from U.S. import tariffs. “Now that markets have some element of the confirmation that tariffs are bringing actual impact to U.S. corporates, there may be a snowflake causing the avalanche scenario as just another factor of worry that now needs to be taken into consideration,” said James Stanley, market strategist at DailyFX. He noted that those bearish on equities were better off focusing outside the United States, at least for now, with Europe one of the weaker links in global stock markets. The return of the bears has already been more pronounced outside the United States, according to data analyzed by Reuters. In addition, a Bank of America Merrill Lynch (NYSE:) study recently found that 58 percent of the 2,767 stocks in MSCI’s global index are now in bear market territory. On Wednesday, the Nasdaq () plunged 4.4 percent in its biggest one-day percentage decline since Aug. 18, 2011, vaporizing $524 billion in market capitalization. The Dow () fell 2.4 percent and the S&P 500 () lost 3.09 percent. Also weighing on sentiment, Citi lowered its global growth forecast for both 2019 and 2020 by 0.1 percentage point each to 3.2 percent and 3 percent, respectively, according to a note published Thursday. In foreign exchange markets, funds flowed to the U.S. dollar and Treasuries and out of the euro and the British pound. The euro shed 0.7 percent to $1.1397 () and breached a major chart bulwark at $1.1430. It was last up 0.1 percent at $1.1407. Sterling hit a seven-week trough $1.2865 , having dropped 0.8 percent overnight. It was last a shade higher at $1.2886. The yen got the usual safe-haven bid, with the euro skidding to a two-month low at 127.68 yen (). Even the high-flying dollar eased to 112.02 yen . was a tad firmer at $1,236.76 an ounce.